The capture of a bighead carp in Lake Calumet, Ill., on June 22 (Tuesday), is the first capture of a live Asian carp between the electric barrier in the Chicago Area Waterway System (CAWS) and Lake Michigan. The capture confirms the presence of live Asian carp with unimpeded access to Lake Michigan and validates earlier discoveries of environmental DNA (eDNA) of Asian carp, which indicated the fish were nearby. The eDNA (DNA in microscopic bits of tissue shed from the fish) was discovered by a research group from the University of Notre Dame and The Nature Conservancy (TNC), led by Notre Dame biologists David Lodge, Andrew Mahon and Christopher Jerde, and Lindsay Chadderton of TNC. The team’s eDNA discoveries prompted increased management efforts by government agencies over the last few months, including dramatically increased efforts to capture or kill Asian carp in the CAWS. The first capture of a bighead carp long after many detections of bighead carp eDNA above the electric barrier confirms that eDNA surveillance is a reliable indicator of the presence of live carp and that eDNA surveillance is more likely than netting to detect the fish when they are not present in great abundance. 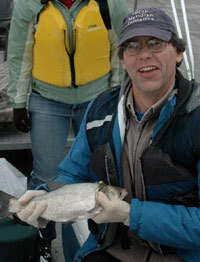 Last year, the research team detected DNA from silver carp in the Calumet River and Calumet Harbor on Lake Michigan. They also detected DNA from both silver carp and bighead carp just south of Lake Calumet on the other side of the O’Brien Lock and Dam, which can be traversed by fish when the lock is open. No barrier to fish movement exists between Lake Calumet and Lake Michigan. The capture of the bighead carp, combined with the earlier repeated detections of silver carp eDNA above O’Brien Lock and Dam, confirms that the threat of invasion of the Great Lakes by both species of Asian carp is imminent, according to Lodge. In addition, Lodge emphasizes the importance of increased surveillance within the Great Lakes. The federal Asian Carp Control Strategy Framework aims to prevent invasion of the Great Lakes because of the high likelihood of harm by Asian carp to Great Lakes fisheries, recreational opportunities and regional economic health. The Notre Dame-TNC research effort to detect eDNA of Asian carp in the CAWS began last summer, with support from the U.S. Army Corps of Engineers. In cooperation with multiple federal and state agencies, future eDNA research by the Notre Dame-TNC team will focus on refining the eDNA tool for use throughout the Great Lakes and beyond. As of this month, the regular monitoring of eDNA in the CAWS has been transitioned to biologists in the U.S. Army Corps of Engineers. The eDNA research illustrates the effectiveness of the partnership between the University of Notre Dame’s Center for Aquatic Conservation and The Nature Conservancy. In cooperation with government agencies, this partnership can quickly contribute to diagnosing and helping to solve urgent environmental problems like invasive species. Such solutions-oriented research on invasive species, land use and climate change will expand under Notre Dame’s new Environmental Change Initiative.